This is the most common pine found in Alabama, although this was not always the case. Longleaf pines (Pinus palustrus) were once the most abundant; therefore, dedicated as the state tree. 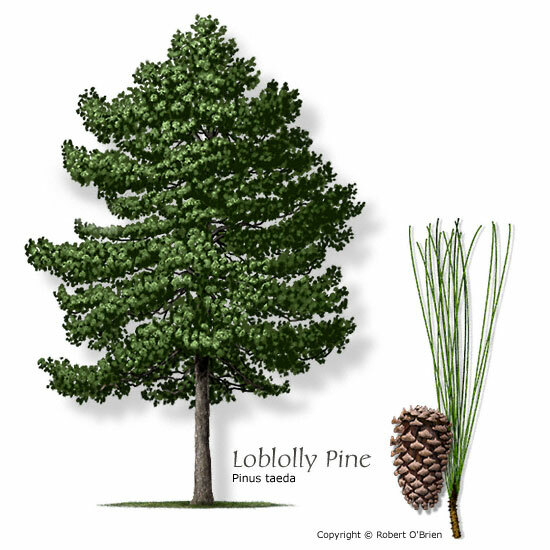 However, the rapid growth of loblolly pine quickly proved this tree to be more desirable for cultivation. It occurs in an extremely wide range of habitats, from moist, poorly drained floodplains to drier, well-drained upland slops. It is only moderately tolerant of shade and occurs in small openings or around the edges of mixed pine-hardwood forests. Wood is used for lumber, construction timbers, pulp, and plywood. Trees are 60-90 ft tall (max 182 ft). Needles occur in threes, and are 7 inches long (between shortleaf and longleaf). Mature seed cones are 4-6 in. long, with sharp, stout prickles, and open at maturity but fall from the tree 2-3 years later.